Is Sammy Trone the Mustangs' next great runner? Mustangs sophomore Sammy Trone wants to finish this season strong and take on leadership roles next year. Current sophomore will have big shoes to fill following Lynne Mooradian's graduation. South Western believes she's up for the task. Everybody in the YAIAA track and field world knows Lynne Mooradian. Not many know Sammy Trone. Yet. Mooradian, the South Western senior who is committed to the United States Military Academy at West Point, has been the face of South Western — and really the entire YAIAA — for the past four seasons. Teammates and opponents milling around during dual meets and invitationals stop dead in their tracks just to watch Mooradian run. 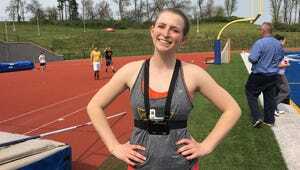 She won first-place medals in all four events she competed in during last year's YAIAA track and field championships, and could repeat that feat on Friday in Dallastown. 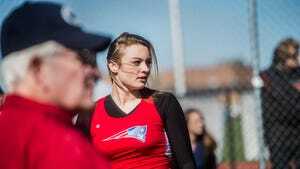 She's won five PIAA state medals in four different events, and looks to add to that count later this month. But next season, she'll be off in West Point and the Mustangs — who have won three division titles in the last four years — will look for a way to replace her production. Mooradian supplies 20 points at every dual meet without much concern, and also provides tremendous leadership for the program. Trone, a sophomore who ran the fastest-winning-400-meter-dash time in the YAIAA this season and runs in two YAIAA-leading relays with Mooradian, always seems to be by Mooradian's side during practices and meets. Trone has spent two years consuming every word of advice from her senior teammate, who South Western coach Bruce Lee called the best female track athlete he's seen in 31 years of coaching. Trone soaks in the advice in every aspect of the sport. How to get quicker starts off blocks, how to move her arms while running, even how to stretch and what to eat. Pancakes or pasta before races: good. Yogurt: not so much. Not all of her knowledge comes from talking to Mooradian. Sometimes she learns just as much simply by watching and following along. With a strong senior class and promising talents coming up from the middle school ranks, Trone hopes to inspire her teammates in the future the same way Mooradian has for her. But first, she has her sights set on finishing this season with a postseason run deep into May. South Western's 1,600 relay team, which typically features Trone in third leg and Mooradian in the anchor leg, has already qualified for districts and Trone believes could qualify for states. She also has high hopes in the 400 dash, where her personal-best time is a league-leading 1:00.3. 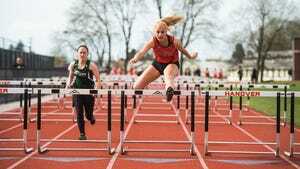 Trone hopes to break a minute and win the event at Friday's YAIAA Championships in Dallastown. She placed fourth last season, while Mooradian earned the title. “That's my main event," she said. "Lynne’s not running the 400 this year so I’m gonna try to win that."